Networking. Do you have a love/hate relationship with it? Yeah, me too. But it’s one of those business skills we need to master so we can break into new circles of influence. Find new clients. Grow our businesses. Form partnerships. Recruit new team members. And here’s the thing. Once you’ve got the hang of it, chances are you’ll really enjoy it. But if growing your business is something you’re driven to do, networking is something you’re going to have to get used to doing. Not everyone is a born networker. Some people are naturally shy and it’s difficult to start a conversation, especially in a room full of strangers. Others just feel like it’s a waste of time, likely because they don’t know how to network the right way. Networking is a muscle you need to work on and develop. And the more you do that, the better you’ll be able to engage in networking meetings and the more comfortable you’ll be. It still may not be your cup of tea, but you’ll start to see progress and momentum in your business. There are a lot of ways to get off on the right foot when you go to a networking event, actions you can take that will help you be more successful. Many of these strategies I’ve learned from more than 20 years growing businesses, and they’re things I’ve had to work at. Still do! Let me share just a few of the most important lessons I’ve learned from watching others and from diving into networking events myself. I know it’s difficult to show up at a networking event, because you’re forced to “work the room” and engage in conversations with others. If this is something that makes you nervous, it’s even more challenging. But showing up on time–or even early–gives you the opportunity to welcome others, have valuable conversations and meet people so you feel less awkward when the actual event starts. Being on time also demonstrates a respect for others’ time and the professionalism of the meeting itself. It’s really Business Professionalism 101. No one wants to hear a rehearsed speech about what you do, but you should still be prepared to talk about your business. Prepare a one or two sentence explanation about your business and practice it in front of a mirror a few times before attending the event. Once there, use that explanation as a guide but know that it’s okay to go off-script a bit. This will help you feel more comfortable talking about yourself and will help your mini-commercial sound more natural. The main goal of a networking event is to make a connection with others. The best way to do that is to ask others: “How can I help you?”–with a project, a promotion, a search for the ideal customer. Be willing to step up and help out. It shows others you care and you’re invested in their success. They’ll be more willing to invest in your success too. Of course, there are many other ways to succeed at networking. If this is something you’re struggling with, I invite you to download my free training, 15 Tips to Master the Art of Networking. 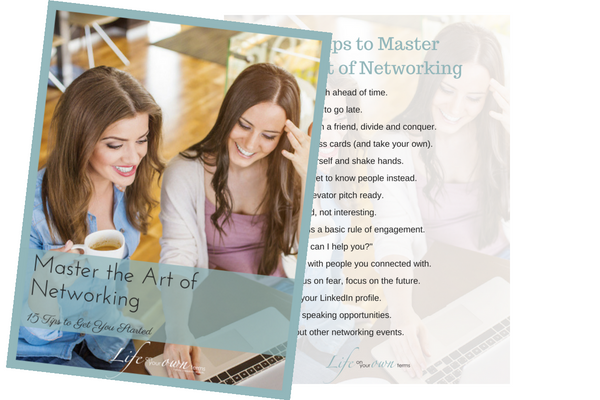 You’ll also receive a downloadable that you can keep handy the next time you attend a networking event. Sign up now for immediate access to the training!